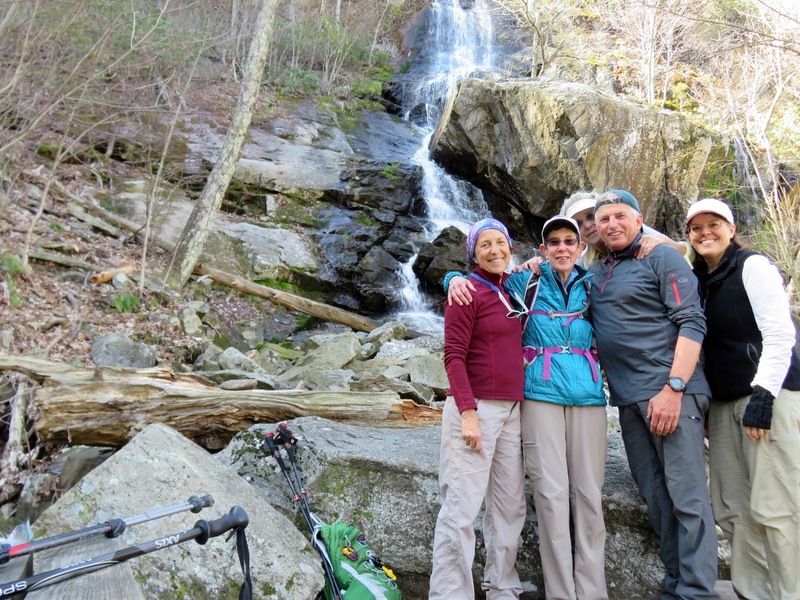 Hike leader, Barbara Martin met Anne Colgate, Elisabeth Demaynadier, Claire Cline and John Herrity at Rockfish Gap. 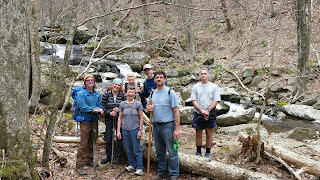 We headed out to Arcadia and the trail head to a wonderful circuit hike: Apple Orchard Falls and Cornelius Creek Trail. It was a perfect day, clear and cool. We made the climb up to the beautiful Apple Orchard Falls and were in awe not only of the falls, but the engineering feat of the wooden steps and landings climbing up and past the falls. After walking for a mile on a fire road we started down the Cornelius Creek Trail, the second part of the double whammy of this circuit hike. 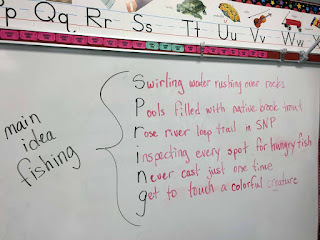 We saw many wildflowers, including the first trillium of the year and many beautiful pools and cascading water over mossy rocks. All were in agreement that this hike is worth the drive to get there. It was a beautiful early spring Saturday for a joint trail maintenance project between the PATC Charlottesville and South Shenandoah Valley chapters along with the Virginia Environmental Law Forum@UVA Law School. Mark Gatewood (PATC SNP South Associate District Manager and SSV chapter stalwart) chose a relatively steep A.T. on the south side of Bear Den Mountain for trail improvement and supervised the day's work. We spent the morning rebuilding and cleaning drainage outflows from waterbars, sometimes installing stepping stones on the downhill side. The work was spearheaded by C-ville chapter's John Shannon and UVA Law's Olivia Glasscock. We enjoyed a pleasant and sunny lunch at the famous tractor seats on top of Bear Den Mt. (only two seats remain!). Mark photographed the three towers no longer in use which are scheduled to be taken down soon. We hiked back south on the A.T. to conclude our work for the day. This involved more waterbar repair along with building several "mini" check-dams using the plentiful greenstone all around us. Time seemed to fly this day and it was 3:00 before we knew it; Mark called it a day. Before putting away the camera, the author noticed some Bloodroot blooming on a bank just below McCormick Gap. This beautiful harbinger of spring was a nice antidote for the greening and plentiful privet, multi flora rose and oriental bittersweet we had encountered earlier this day! 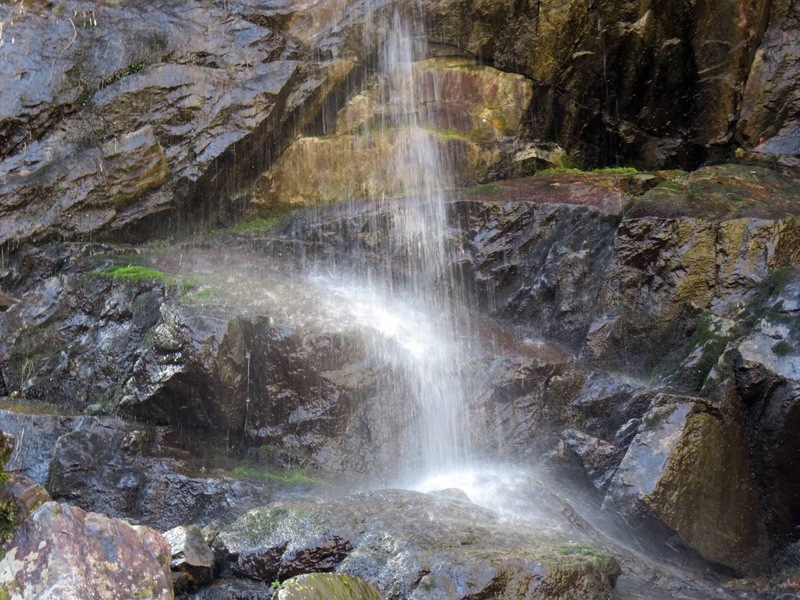 The Three Falls hike is a circuit that passes Rose River Falls, Dark Hollow Falls, and Lewis Spring Falls. These are three of the most beautiful falls in the SNP. We had a total of 9 adventurous hikers today. Charles Staples, Dan Ralston, Jeanne Densmore, Dan Funkhouse, Jacque Ensign (visiting from Seattle), John Brandt, and James McAdams. 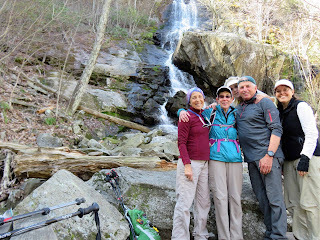 We had lunch along the Rose River and met up with the short hiking group lead by Iva Gillett and took a group photo at the base of Dark Hollow Falls. We walked past the visitors center to the horse trail and around to Lewis Falls and back to the amphitheater where we parked. No flowers yet, but the temp was pretty mild and the rain held off. Everyone had a great time. 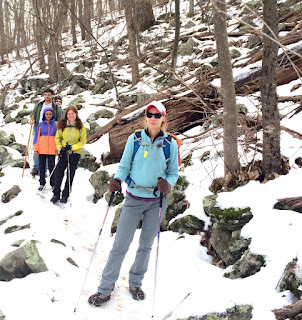 In addition to the long hike, nine hikers chose a shorter, though similar loop. This group included: Jeanne Siler, John Herrity, Karl Mons, Pete and Bev Fink, CJ Woodburn, David Crowe, Bill Holman (sweep), and Iva Gillet. We started on the Skyline Drive, descending toward the Rose River Falls, along the horse trail. As we approached the first falls, we spotted some guys fly fishing. 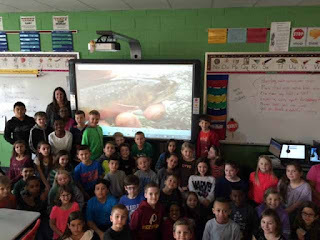 Upon inquiring about their success, we found that they were elementary teachers from Northern Virginia, out for an overnight camping trip. Edward Abram had been raising brook trout in his classroom, and were curious to see how the fish compared to those in the wild. Continuing on, we reached the Hog Camp Branch, and climbed the hillside to see if we could find the old copper mine. Iva has seen it years ago with John Shannon. Since we did not have the benefit of him and his GPS, we poked around the rocks and found an opening that Iva thought was what John had shown her. Is this it, John? Despite Bill Holman clamoring for lunch prior to the climb, the group followed the leader’s directions and hiked onward so that we could eat beside the stream. CJ chose a perfect spot, and we enjoyed our lunch and some dark chocolate chip almond cookies. During our meal, the long hiking group stopped just below our spot, and despite his best efforts, Bill was not able to sneak up on their group undetected. Up we climbed to the base of Dark Hollow Falls, where we took this big group picture. We let the faster long hikers go first, and then followed up the Dark Hollow trail, enjoying the magnificent flow in the falls. When we arrived back on the Skyline Drive, we followed the horse trail back to our cars, finishing about 2:30. Though a bit overcast, we had no complaints about the pleasant temperatures and ample water in this beautiful section of the Shenandoah Park. Today’s hike was a joint hike with the Southern Shenandoah Valley chapter, and the Charlottesville Chapter near the North River Gorge. Lynn Cameron had assembled her group AND run the shuttle before the Charlottesville group even arrived. 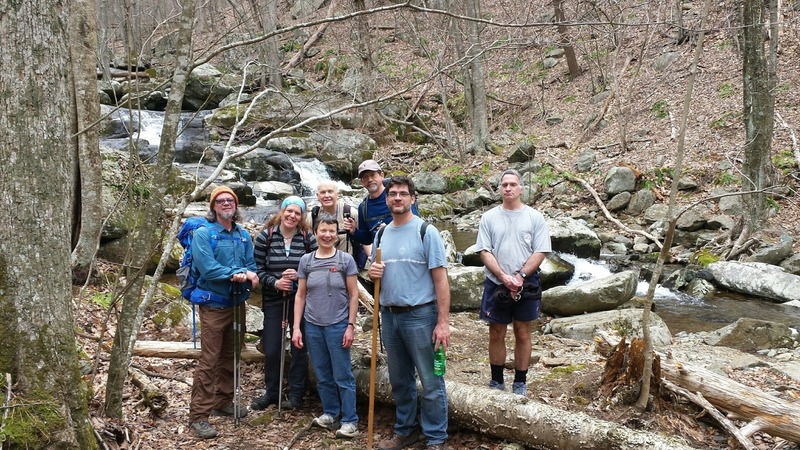 The SSVC hikers included: Gabriel Garretson, Greg Fife, Jana Walters, Edda Duff, Bob Eggleston, David Bennick, Christa Neher, Terry Slater, Don Blume, Ron Stoltzfus, Michael Seth, and Lynn and Malcolm Cameron. Many of these hikers are also hike leaders, so even when our group of 20 spread out, everyone was safely with someone who knew the area. The SSVC was also measuring part of the trail to help with a hiking book. Traveling from Charlottesville were: Art Bykonen, James McAdams, Bill Holman, Jacque Ensign, Tony Alimenti, John Sinclair, and Iva Gillet. 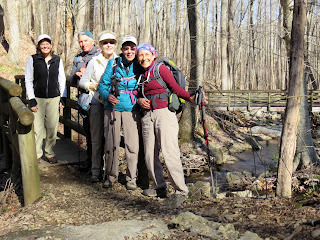 Jacque and Tony were first time hikers with us, and we hope they will join us again. 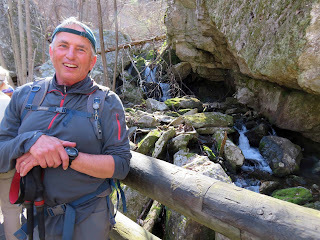 Lynn had planned a wonderful hike which began by walking along the Gorge, then crossing the Camp May Flathers bridge to reach the base of Lookout Mountain. We gradually climbed until we reached the ridge line providing views to the west and east as we hiked. Lovely! Just as the group was getting ready for a lunch mutiny, we came across the front of the pack, who finished wheeling the trail, and had stopped for lunch. Our group spread out and shared some treats that Tony and Iva brought with our meal. Then off we went on the trail. With such a large and varied group, the conversation was stimulating. We hiked as we descended the mountain, finally following a fire road that also allowed for mountain bikers. Upon reaching the North River campground area, the shuttle cars were there to haul us all back to the Wild Oak parking area. We look forward to more joint hikes, with trips to new places, and the interesting interactions that follow. Hike Leader Dan Ralston started the hike at Reeds Gap hiking south on the AT to Three Ridges. It was a beautiful warm day but on the sides of the hills that don’t get the morning sun the ice and snow was abundant. All of the hikers had the perfect forethought to bring their traction devices. The group stopped at Hanging Rock for lunch. Here the group broke into 2 hiking groups. The first group of Bev and Pete Fink, Pat Choloski and Lindsay Brown made this their turn around point for a nice 7 mile hike. 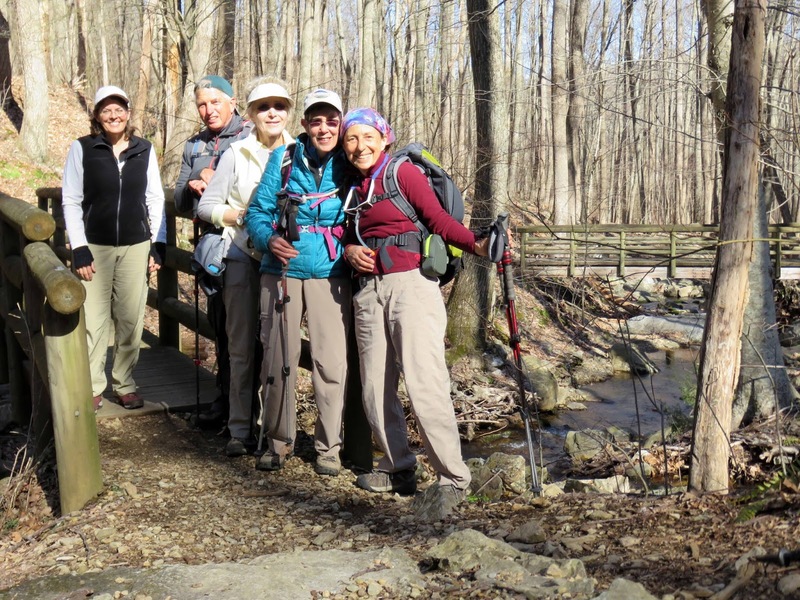 Dan’s group of Jeanne Densmore, Kelly O’Rourke, James McAdams and Anne Colgate continued to the summit of Three Ridges to turn around for a 9 mile hike. 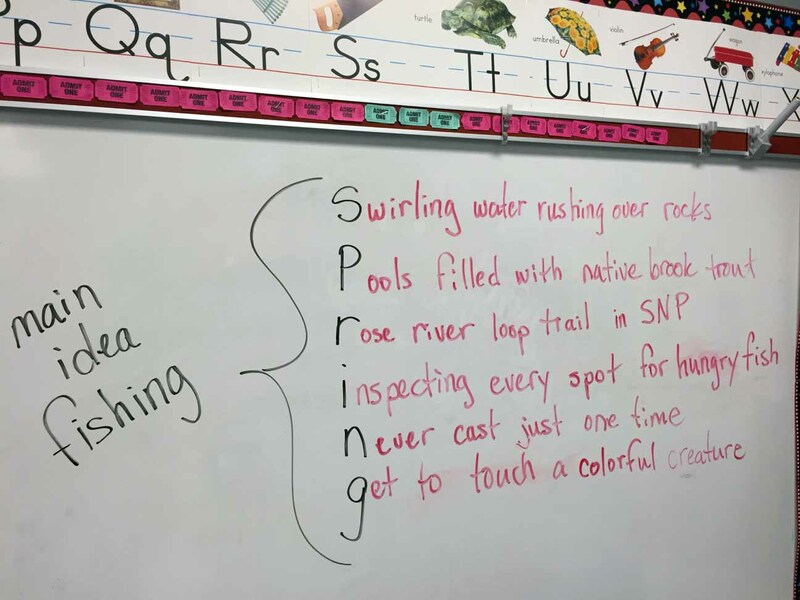 The spring like day was enjoyed by all. This year’s soup hike had an all-time low number of attendees, likely due to the exaggerated forecast of cold and high winds. 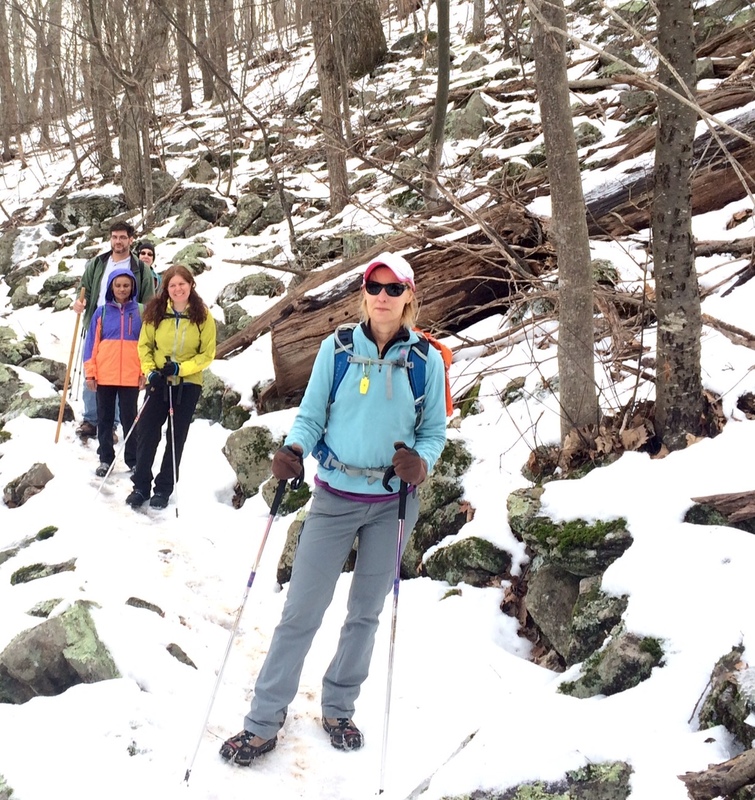 With morning temps in the low 20’s, this year’s hike was predominately attended by hike leaders and the hiking regulars, other than one new hiker - Mieke Zylstra. She valiantly hiked an eight mile loop with the hiking veterans, despite having a choice between a four mile out and back hike with Bill Holman, Bev and Pete Fink or an eight mile loop with Iva Gillet, David Crowe, CJ Woodburn, Kelly O’Rourke, Brian Muszynski, Dan Ralston and Jeanne Densmore. It was blustery, but with the layers we all know are necessary for winter hiking, we were all warm, shedding layers in the ascent and retrieving them on the descent. Remi, Iva’s daughter's dog, led the hike, since she knows the trails on Flattop Mountain near Simmons Gap well hiking them many times with Iva. With the entire hike on the gravel roads in the NW corner of Albemarle County, facing mostly south, we encountered little snow or wicked wind. After two miles, Bill, Bev and Pete returned to the farm to heat up the soup and prepare lunch. After a snack and water break the rest of us slowly completed the 1500 foot climb part of the hike in four miles at the entrance to the Flattop subdivision. 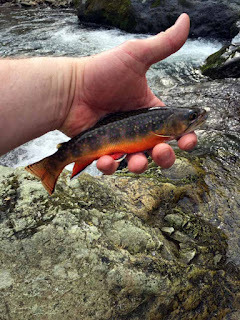 With nice views along the way, they culminated at the apex of the day, with views west to the Skyline Drive, Bacon Hollow, Bingham Mountain and toward Swift Run Gap. After pausing to enjoy the views of our labor, we descended toward Stone Mountain Vineyard (closed for the season), across Wyatt Mountain and down Brokenback Mountain to Shady Grove. Completing the circuit at about 1 PM, we returned to three homemade soups, which Bill had carefully prepared for our enjoyment. With bread brought by Brian and Mieke, we all feasted. The group was all glad to have gotten some exercise on a sunny, cold day and then been able to share delicious food with fellow hikers.